The Stony Brook University Ranking is 85th best college in the USA and 126th on the University Review World Ranking List. 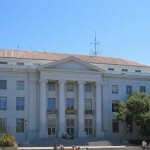 It is ranked as the 88th best college in the states by the USnews, and the 249th best by Forbes. 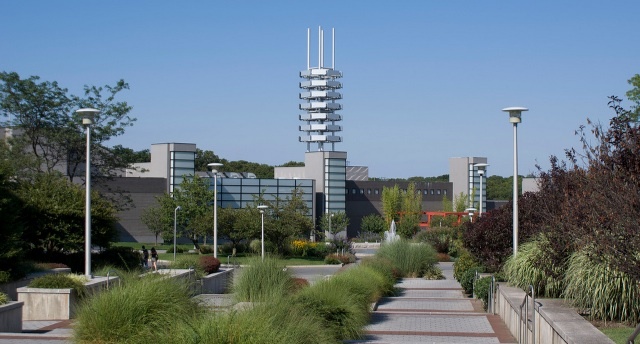 The Stony Brook University tuition fees are $8,430 for in-state and $21,850 for out of state students. It is a very selective college accepting 39.5% of applicants. Financial aid offered totals $61 million per year, an average of $11,490 per student. SAT scores for admission requirements (25th-75th percentile) are Math 590 – 680, Reading 530 – 630, and writing 530 – 630. The total composite SAT range for accepted applicants is 1150 to 1350. The requirements for ACT (25th-75th percentile) are Composite 26 – 30, English 24 – 29, Math 25 – 29, and Writing 7 – 9. There are four main members of the State University of New York (SUNY) system with Stony Brook University, which was established in 1957 is located on long island. Charles B. Wang Center at Stony Brook, photograph by spyffe. The other centers of the SUNY system are located at Albany, Binghamton and Buffalo. Arts and Sciences; Business; Engineering and Applied Sciences; Dental Medicine; Health Technology and Management; Journalism; Marine & Atmospheric Sciences; Medicine; Nursing; Professional Development; and Social Welfare. 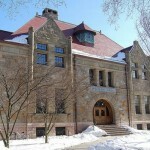 The university has many famous faculty and alumni including the recent award of the shared nobel peace prize given for work on the greenhouse effect given to three of its faculty. Stony Brook university is very active in research and has been involved in many discoveries; these include the creation of a ultrasound method to speed up the healing of bone fractures for treatments such as osteoporosis, the discovery of Golden Bamboo Lemur, finding the cause of lyme disease, and the discovery of hundreds of distant galaxies. As a member of the List of Public Ivy Schools, it is closely associated with institutions such as The Ohio State University, College of William & Mary, University of Delaware, and Miami University. Other colleges in New York state include Columbia, Cornell, New York University, Rensselaer Polytechnic Institute, CUNY City College, SUNY Stony Brook, Syracuse University, Downstate Medical Center, SUNY Albany, MSSM, Rockefeller University, University of Rochester, Yeshiva, and the University at Buffalo. Stony Brook University; New York Colleges.